Belarus's economy continues to shrink, and the government tries to sell proposed reforms for financial support from international organisations. Meanwhile, the IMF notices "considerable progress" in discussing reforms and the World Bank puts forward its vision of the reforms that are necessary to restore growth in Belarus. Belarus continues to boost its military potential by modernising old weapons while acquiring new ones, but its strategy will remain exclusively defensive. Minsk celebrates the anniversary of the 1917 Bolshevik revolution and commemorates Czech Jews killed by the Nazis in 1945. All of this and more in the new edition of the Western Press Digest. The Finance Ministry and the Central Bank are working with international financial institutions to roll out reforms with the hope of securing financial support from the International Monetary Fund. On 9 November an IMF delegation visited Belarus to discuss a new facility that has an estimated worth of between $2 and $3 billion dollars. The government, in addition, wishes to distribute a Eurobond next year worth €1 billion. World Bank discusses restoring economic growth in Belarus through sequenced reforms – Belarus’ economy, according to the World Bank, requires institutional changes that assist in fostering enterprise performance, innovation, and the diversification and establishment of new markets for Belarusian products. Such reforms include managerial incentives, job skills development and overall improvement in Belarus’ business climate. Weak foreign and domestic demand will cause the economy to contract by 3.5% in 2015 and by 0.5% in 2016. Mr. Young Chul Kim, the World Bank’s country manager for Belarus, stated that, “The purpose of a comprehensive reform is to remove structural constraints which have prevented the Belarusian economy from realising its maximum potential.” In addition to sequenced reforms, potential membership accession into the World Trade Organisation (WTO) could help stimulate substantial income growth. Fitch rating for the Belarusian National Reinsurance Organisation (Belarus Re) Insurer Financial Strength (IFS) received a B minus – Belarus Re functions as the national monopoly reinsurer. This monopoly has grown to 100% in 2014 from 10% in 2006. The rating received is a reflection of 100% state ownership of Belarus Re. Although there is no direct agreement between the company and the government, various capital injections at its inception have occurred over the recent years. In Fitch’s view Belarus Re’s investment portfolio is of lower quality due to the constraints of sovereign risk, the presence of issuer concentration and the quality of local investment instruments. Belarus Re’s has limited options to diversify due to a limited investment market and strict insurer’s investment policy regulation. Belarus military strategy is exclusively defensive – Polish Rzeczpospolita quotes Lukashenka, as he visited the military industry plant in Dziaržynsk district. 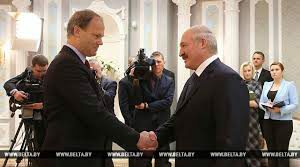 Belarus will cause unrecoverable loss to those who dare to attack it, and the development of rocket forces is a major goal in this strategy, Lukashenka said. Belarus has been boosting its military potential in recent months, receiving four Jak-130 jets. By 2020 it will have replaced its MiG-29 with Su-30SM jets and have purchased new Jak-152 training planes from Russia. Also, Belarus will receive four surface-to-air missile systems, the S-300, and it is currently in negotiations with Russia to acquire the more modern S-400 systems. In 2015 Belarus strongman Lukashenka repeatedly said that his country will not give any land to an aggressor. According to him, Belarus became one of the most militarily powerful counties in Eastern Europe after the considerable modernisation of existing forces and the development of its own weapons. Minsk celebrates the anniversary of the 1917 Bolshevik Revolution – In celebration of the anniversary of the 1917 Bolshevik Revolution a new Soviet-themed shopping mall has been opened in Minsk. The Leningrad Mall, a four-floor glass building, is decorated with Soviet memorabilia and propaganda paraphernalia. The shopping centre is a growing reminder of Lukashenka’s Soviet nostalgia and ritualistic opening of shops and centres during the anniversary of the Bolshevik Revolution. Unveiling of a memorial for Czech Jews killed in Belarus – Radio Free Europe/Radio Liberty covered the ceremonial unveiling of a memorial for 6,000 Czech Jews who were deported from Czechoslovakia and then killed in Minsk in 1945. The ceremony was held on 23 November on the 70th anniversary of the first groups deportation from Czechoslovakia to Belarus. The Minsk Educational Centre of Johannes Rau established the memorial. Milan Ekert, the Czech Ambassador to Belarus, was in attendance. Man is sentenced to death in Belarus – On 20 November a Hrodna court in western Belarus found Ivan Kulish guilty of murdering three female salesclerks during two separate store robberies. Mr. Kulish has been sentenced to death. Belarus remains the only country in Europe that still utilises capital punishment. Since Belarus’ independence in 1991, roughly 400 felons have been sentenced to death. Before the elections, many publications dealt with the subject of reform in Belarus. The analysis revolved around the post-Soviet space analysing the explicit degradation of the era of a commodity economy. This means that all these states will have to change, including Belarus. Minsk has already signalled by its actions its intention to change many things in its economy and politics. It is not only about its participation in the Ukrainian events. Belarus has taken seriously the optimisation of economic processes. Lukashenka said clearly during his inauguration ceremony that reforms were a “destruction of the foundations of the state system”. In terms of the Belarusian ruling elite, the words “reforms” and “reformism” are almost identical to the word “evil”. For Lukashenka, a declaration about the need for “structural reforms” would be equal to a declaration “I have been wrong, and my policy is inefficient”. Instead of these “bad” words, Lukashenka uses “modernisation”, “development”, ‘improvement”, “transformation” and other similar words. Thus, the “reforms” applicable to a Ukrainian scenario are hardly possible in Belarus. There will be no discussion or debate. Nor will the regime use the word “reform” (at least, in language most of the population understands). Whether any deeds will follow is another question. The sanctions have been and remain the key problem for Belarus. This is not only an issue of trade. The imposition of sanctions limits investment opportunities and obtaining long-term cheap loans. Besides, what is most important, is the need for Belarus's to engage in scientific cooperation and technology exchange. For now this remains impossible. However the problem's resolution is near. The United States has actually lifted most restrictions it imposed, and the European Union has suspended sanctions. Moreover, even prior to the formal lifting of sanctions, the restrictions on scientific cooperation were cancelled. As a result, during the spring and summer of 2015 Belarus entered into projects in the framework of the Horizon 2010 programme, it joined the Bologna Process unexpectedly and intensified cooperation with the European Research Council. Belarus carries out an interesting policy towards Ukraine in the unusual role of a donor. The Belarusian State Committee for Science and Technology, together with the Ukrainian Ministry for Education and Science, launched joint research programmes. The list of topics includes optics, new materials, bio-technologies, pharmaceuticals, computer science, energy and energy efficiency. Publications analysing “Belarusian reforms” called all of them a priority in the “new economy of the country”. At the turn of 2005-2006, when Russia’s influence on the economy became extremely important, Belarus understood that the commodity economy would not become successful. Since then, Belarus has started a gradual movement towards seeking a counterweight to Russia. The Belarusian authorities are trying to find new options and allies beyond the usual East – West axis. In particular, they are working on the development of ties from the Baltic to the Black Sea, along the North – South axis. Besides, they are trying to work among the old members of the European Union. However, a number of problems remain. The traditional “power centres”, Germany and France, are rather strongly linked to Russia. Here, a new partner of Belarus has emerged, the United Kingdom (UK). By trade volume the UK has unexpectedly become Minsk’s second foreign trade partner. Besides, “friendship” with the United Kingdom is facilitating an intensification of cooperation with almost two dozen further countries which are members of the British Commonwealth. These countries are ready made money, technology, and sales markets. Significantly, exports to the Commonwealth countries grew by $2.431 billion during the first 8 months of 2015 in comparison to 2014. Ukraine’s attempt at European integration opened a window of opportunities to Lukashenka. Further developments and Belarus’ own competent policy have extended it. These are the issues of sanctions and foreign trade. The dynamics of trade turnover between Belarus and the European Union appear much more promising than the path of "going to Europe" which Ukraine has embarked on. In sum: Belarus understands that there will be less money and works on plans to get access to the funds. So far it has managed to achieve an increase in funding. In parallel, it is growing a network of political connections and the weight of its political lobby, and this is against a backdrop of a collapse of its neighbours’ influence. There is one small thing, an efficient state. Now, let us talk about the managers. Indeed, the “quality” of most Belarusian managers remains poor. However, here we face some interesting facts taken from the practical activities of the country’s leadership. 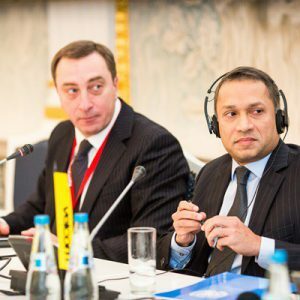 Both presidential advisor on economic matters Kiryl Rudy and deputy head of the Presidential Administration Mikalaj Snapkoŭ made their statements at the October Economic Forum. Interestingly, independent research centres organised this event. The authorities see most of these centres as an “opposition”. Just a year ago, it was impossible to imagine even the very fact of this kind of forum being held in Minsk, let alone a statement by a top official of the Presidential Administration. In Belarus, the MOST programme started unbeknown to many, the financing of 500 visits of stakeholders and managers in different spheres (NGOs, business, authorities, and research) to the European Union to establish partnership relations. The number of participants is 1,500 people. Such a scale in the framework of Belarus could entail important changes. The Belarusian authorities gently engage clever “opposition activists” in a dialogue. The question is not about the participants in the presidential elections, rather there is silence there. The authorities invite those who generate ideas on the country’s development, as well good analysts, to participate in discussions and closed meetings. Thus, the situation with personnel policy is also very interesting. A statement of fact is that there is a shortage of personnel. And there are signs of work in this area. As Kiryl Rudy said at the October Economic Forum, “One can get an official answer whether the reforms will happen in 2016 only from the official documents and decision of the head of state”. Let us use this recipe. I will cite a few facts, which happened during the last few weeks. In 2016, concessional financing and subsidies will be significantly reduced. Those who will still be able to raise funds will survive. The others will undergo restructuring through bankruptcy. The same will happen to agriculture. The parliament is considering a draft law on transitioning from a planned economy to “indicative planning”. The National Bank and the Ministry of Finance pursue a rather tough policy on the rehabilitation of the financial system, as well as declarations (including those ofLukashenka) about the “inappropriateness” of getting “expensive” money on foreign markets. The topic of “financing” should also include such an instrument as the public-private partnership, which is expected to be enacted in legislation in 2016. Since 2016, Belarus will have new money in circulation. The redenomination will take place, which includes the introduction of Belarusian coins. Automatically, it means giving up the opportunity to use inflation to control the economy. Back to the Question: Will There Be Reforms in Belarus? The point is simple, the regime will not change one iota politically. It will be the same authoritarianism. As for the economy, we are unlikely to hear loud statements about “Belarusian reforms”. How should we call what is happening today?.. Fundamentally, it does not matter. On the other hand, people in Belarus will fail to feel a positive effect in the coming years. After all, if one proceeds from the thesis of economic reform, the quality-of-life forecast for an average Belarusian is negative for 3 to 5 years. And even in Belarusian conditions, the reforms will not give a positive effect before 2020. Incidentally, this is a dig at populist reformers who say that a “people’s paradise” will happen soon in Ukraine. There has been not a single country in the world where structural reforms gave an instant result. In any case, it will be interesting. One country is being publicly “reformed”, with beautiful slogans, TV shows and political battles. The other one seems to be against the reforms but it does something. It is an interesting question to what will be the result?